Racing in the GTLM class (known as GTE-Pro in the FIA World Endurance Championship) there are not many chances for Porsche North America Racing to score outright victories with their brace of Porsche 911 RSRs. Thanks to the proliferation of prototypes (like the Porsche 919 Hybrid) in both the FIA WEC and the Tudor United SportsCar Championship, the slower GT-class machinery is often overshadowed when it comes to the overall placings. This weekend, that will change at Virginia International Raceway though as the two-hour, 45-minute endurance race – round nine of the 2014 TUSCC – will see only the GTLM and GTD classes compete, with the possibility Porsche could take their first overall win in a major US race since the 2003 24 Hours of Daytona. Richard Lietz, partnering Nick Tandy in the no. 911 RSR, has never driven the VIR circuit before. The no. 911 and no. 912 Porsche 911 RSRs of the factory US squad will be looking to emulate that famous victory, achieved by The Racer’s Group and their Porsche 996 GT3 RSR, on Sunday at the 3.27-mile Virginia circuit. At the last TUSCC meeting at Road America, the two works RSRs showed much improved pace thanks to a Adjustment of Performance ruling that brought Porsches onto a more equal footing with the dominant Corvettes and BMWs. Nick Tandy and Richard Lietz came close to a first victory for their no. 911 crew since the season-opening enduro at Daytona only to be stymied by a pit infringement penalty. The Austro-British pairing will be looking to make up for that disappointment in round nine. A stalwart of the US racing scene, Patrick Long will be looking for another podium in Virginia, while helping his inexperienced teammates get up to speed. This weekend will mark Lietz’s first visit to VIR with the 24 Hours of Le Mans-winner “playing iRacing to learn the track”. In the sister no. 912 car, Patrick Long has plenty of experience at the Virginia circuit, something that Lietz has found beneficial to his learning experience. 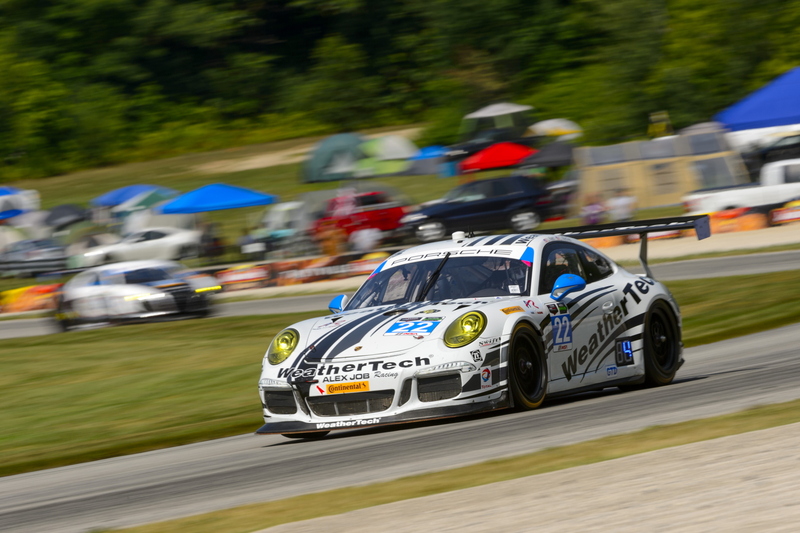 After Road America, Long and co-driver, Michael Christensen now find themselves as the lead Porsche 911 RSR in both the drivers’ and teams’ championship and should be set for another good result this weekend. Porsches’ 911 RSRs lost some top speed in the latest AoP changes however, with some aerodynamic grip to play around with, the two cars should suit the fast VIR track, where slow corners lead onto long straights, making good traction a necessity. Can Team Falken score a breakthrough overall podium at VIR as they head towards Petit Le Mans in October? In the GTD class, the no. 22 Alex Job Racing Porsche 911 GT America leads the Weissach charge, sitting second in the teams’ classification, just three points behind the no. 555 AIM Autosport Ferrari 458 Italia. Total 911’s Supercup columnist, Ben Barker will not be joining the lineup in his semi-regular GB Autosport seat as this weekend’s TUSCC round clashes with the latest Supercup race, taking place at the fearsome Spa-Francorchamps. Practice gets underway today, with the GT action starting at 2:50pm ET. Tomorrow sees the GTD and GTLM fields qualify at 12:30pm and 12:50pm respectively, before the 165-minute race starts at 4:05pm on Sunday. Alex Job Racing’s no. 22 Porsche 911 GT America is currently the highest placed GTD Porsche, sitting second in the teams’ standings.